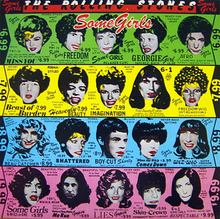 THE ROLLING STONES: SOME GIRLS: 1978: 5 STARS OUT OF 5 STARS: My first Stones album that I bought upon release and it remains one of my favorites- and the last Stones album that in my opinion deserves 5 stars- and this came out forty years ago. I bought Some Girls and Dylan’s “Street Legal” at the National Record Mart in Pittsburgh after a ballgame. My friend Randy and I rode a bus up to Pittsburgh for the Pirates game. We were waiting at the bus stop to get picked up and I had 5 minutes so I ran across the street and got both albums -they cost $4.99 each. As I was paying I looked out the window and the bus had just pulled up. I just made it in time. The next bus was 6 hours later. I wish I had missed the bus now- because if I had- Dizzy Gillespie was giving a free concert that night just down the street. That is what we would have done. Randy said if I had missed the bus I would have been on my own. Favorite tracks- Miss You, When The Whip Comes Down, Some Girls, Lies, Before They Make Me Run, Faraway Eyes, Beast of Burden, Shattered, Respectable. This album was a big comeback not only artistically but in popularity- the great reviews had returned and the fans gobbled this one up sending it to #1- Miss You topped the singles chart, Beast of Burden made #8 and a third single “Shattered” went to #31. They should have disbanded after this and went out on top. THE CLASH: GIVE’EM ENOUGH ROPE: 1978: 4 1/2 STARS OUT OF 5 STARS: The Clash’s second album- it was the first issued in the US- and the first one that I bought. Produced by Sandy Pearlman of Blue Oyster Cult fame which was an odd choice. If I have any problem with this album it is the slick sound. Some fine songs here – Safe European Home, English Civil War, Tommy Gun, Julie’s Been Working For The Drug Squad, Last Gang In Town, Stay Free, All The Young Punks. Side 1 is stronger than side 2. My least favorite album but it’s still a near classic. HAMILTON: AN AMERICAN MUSICAL: 2015: 5 STARS OUT OF 5 STARS: I am not a big fan of plays but I’d love to see this one. To listen to it straight through from start to finish you have to set aside some time- the 2 discs clock in at 2 hours and 22 minutes and some change. 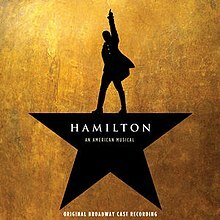 I am a big history fan so this was a natural-I loved Ron Chernow’s book and Lin- Manuel Miranda certainly does it- and Hamilton justice. There had been talk of replacing Hamilton on the $10- that talk has since died. Miranda saved him. 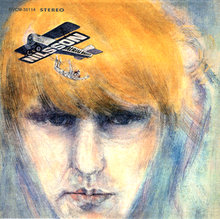 HARRY NILSSON: AERIAL BALLET: 1968: 4 STARS OUT OF 5 STARS: How odd that Nilsson an outstanding songwriter is best remembered by most for two songs he didn’t write- Everybody’s Talkin’- which is on this album-and featured in the movie “Midnight Cowboy”- and the later song “Without You” also a cover. Harry’s One- would become a top 5 hit when covered by Three Dog Night. 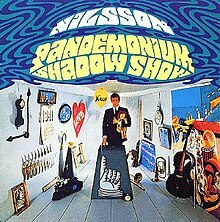 Only Nilsson could write a song about his desk- “My Old Desk” and it is a favorite here. THE KINKS: THE ULTIMATE COLLECTION: 2002: 4 1/2 STARS OUT OF 5 STARS: Two Discs- 44 songs. The first disc contains every Kinks charted single from 1964-83. Disc 2- b-sides and singles that didn’t chart. It is an uneven kind of listen. There are a number of great Kinks songs not on this set because they were album cuts. Mrs. Postcard is not a list person like I am but if she were to compile a Top 10 favorite songs ever list- there is one song I am confident that would appear on both my list and her’s– Waterloo Sunset. Some Girls is a great album. My favorite is Before They Make Me Run, Beast of Burden and the title track. On the Kinks collection…there are so many favorites.